Hi, my name is Lennart. I have always been interested in technology and started learning programming at the age of 12 after visiting a local hackathon. Since then, I have attended many Meetups and Hackathons to enhance my knowledge, share my experiences and get in touch with others. 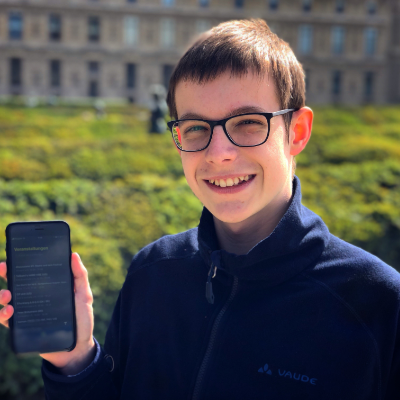 In 2018 I won an Apple Scholarship and was invited to attend their Worldwide Developer Conference in San Jose. The moers festival is a major international event of modern improvised music. It takes place at Whitsuntide and stands for a willingness to take risks and the courage to innovate. It thus guarantees musical discoveries beyond the mainstream. The festival is characterized by an adventurous spirit and the crossing of borders, and it is a declared intention that the musical edges are far apart. The app gives an overview of the program at all festival locations and provides you with the most important information about the festival. The latest news will be transmitted via the moers festival Twitter channel. What else is posted on the social networks Twitter and Instagram under the hashtag #moersfestival, we also get in the app. Push alerts can be activated for very important messages. So we can inform you about spontaneous program changes as well as about specials or storm warnings. You live in the city of Moers, are just visiting or want to take a look around the city and shops? - then this app is the right choice for you! Move virtually and comfortably through the city its stores from the couch with interactive 360° panoramic views. Find shops and gastronomists by industry and check if they are still open and start the navigation! Find the best parking space for your visit in the city centre with current parking figures and check how their occupancy has developed in recent times, so you don't have to drive around the city unnecessarily! To make sure you don't forget to put the rubbish bin on the street, you can be reminded of the emptying the evening before with a push message. The current petrol prices can be called up and compared! 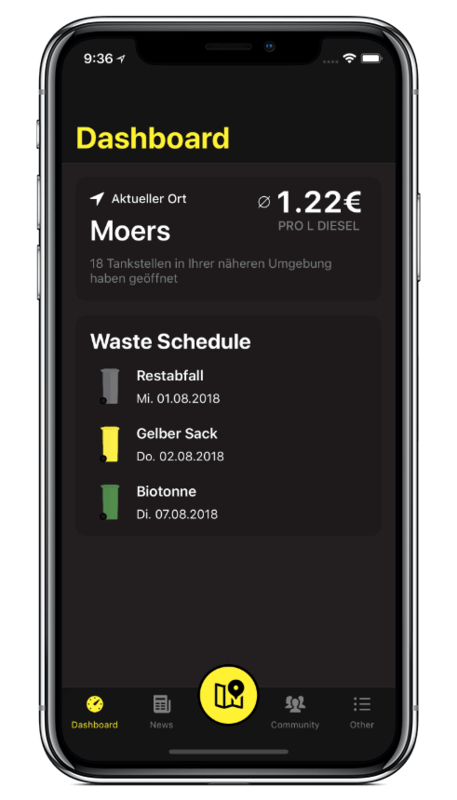 Inhabitants of the city of Moers can now use the street-based waste calendar to keep track of the pick-up dates. To make sure you don't forget to put the rubbish bin on the street, you can also be reminded of the emptying with a push message the evening before. In order to never miss a great event again, you can find events in Moers and the surrounding area. © 2018 Lennart Fischer. All rights reserved. Apple and Apple logo are trademarks of Apple Inc.
App Store and App Store logo are trademarks of Apple Inc.
Android and Android logo are trademarks of Google LLC.